China has completed the installation of the irradiator to the world’s largest radio telescope FAST, according to China radio International (CRI). The irradiator is used to collect radiation that it sends the dish-reflector telescope, and amplifies the signal, allowing you to register it instrumentation. According to China radio International, feed weighing 30 tons was finally installed on Sunday. It is located at an altitude of 130 meters above the surface of the telescope. At the moment the feed is able to receive signals, completed work on setting it up. The construction of the telescope, an area equal to the area of 30 football fields, began in March 2011. 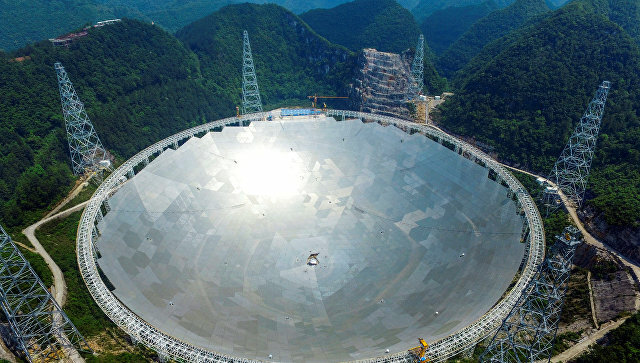 The telescope is located high in the mountains of Guizhou province in southwest China. The diameter of the telescope is 500 metres away. The perimeter of the structure is equal to 1.6 kilometers. The total investment in the project is estimated at 1.2 billion yuan (about 180 million dollars). China Central television reported earlier, FAST will be connected to one of the fastest computers in the world Sky Eye 1 for astronomical calculations with the purpose of finding life on other planets and the study of dark matter. It is expected that the new telescope will greatly improve China’s capabilities to study outer space. After the Chinese engineers fully assemble the telescope, it will surpass in size the largest at the moment telescope in Puerto Rico, the diameter of which is 300 metres away.